We've arrived at week 9 of Wednesday Comics already! Wow. Only three issues left! Oh where oh where did you go summer? I miss you. Anyway, here's a sample of my art for the current issue. Enjoy! In other news, I'll be doing a signing later this month at Hub Comics in Somerville, MA. The signing will be held from 7-9 pm on Wednesday, September 23, commencing the release of the final issue of Wednesday Comics! I'll have t-shirts and original artwork to look at (buy? ), so if you're in the area, stop on by! Beyond that, I've also just been added to the guest list for this year's Big Apple Con in New York this October. New Yorkers? I look forward to seeing you. Yes. 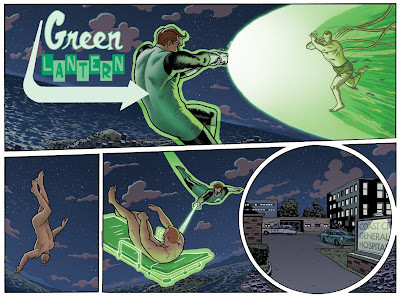 Okay, I just found out about Ch'p the Green Lantern and I think you need to draw him. Or, you could do him as a Fallen Lantern. Zombie-Squirrel-Lantern-business...it doesn't get better than that! Squirrel Space Cop = Awesome.